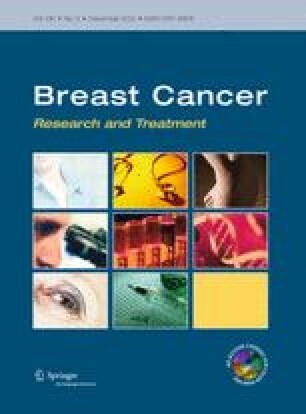 Studies on well characterized, large populations of estrogen receptor (ER)/progesterone receptor (PgR)/HER2-negative [triple-negative (TN)] breast cancer (BC) patients with long-term follow-up are lacking. In this study, we analyze clinical outcomes of TN BC and implications of epidermal growth factor receptor (EGFR) expression. Clinical and biologic features, time to first recurrence (TTFR), and overall survival (OS) were compared in 253 TN versus 1,036 ER positive, PgR positive, HER2-negative [estrogen-driven (ED)] BC. Compared to ED, TN tumors were larger (p = 0.02), more proliferative (high S-phase 54 vs. 17 %, p < 0.0001), more aneuploid (64 vs. 43 %, p < 0.0001) and more likely EGFR positive (≥10 fmol/mg by radioligand-binding assay, 49 vs. 7 %, p < 0.0001). Among TN, EGFR-positive BC were larger (p = 0.0018), more proliferative (p < 0.0001), and more aneuploid, (p < 0.0001) than EGFR-negative BC. Adjuvant-treated TN patients had shorter TTFR (p = 0.0003), and OS (p = 0.0017), than ED patients. However, in untreated patients, no differences in TTFR and OS were observed at 8 years median follow-up. Among TN patients, EGFR expression was not associated with worse outcome. TN tumors have a worse outcome in systemically treated patients but not in untreated patients. EGFR expression, does not predict for worse long-term survival. The Authors have no financial disclosures to declare. This study was funded in part by a NIH grant P50-CA58183 (SPORE) and a Susan Komen for the Cure Foundation Post-doctoral Fellowship Award.